Lorenzo Da Madice, the initiator of this project, is a native of Verona, Italy, and a graduate of the University of Milan. 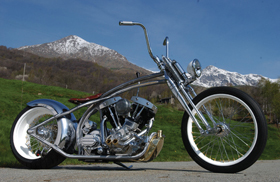 Eurocomponents, his 6-year-old venture, has fast become the U.S. gateway for all manner of wonderfully crafted Euro-parts for Harleys. Lorenzo imports parts from Italy, Germany, France, the Netherlands, Switzerland, and Sweden. Recently, a number of products designed by Lorenzo and manufactured right here in the U.S., to Eurocomponents’ specs, have also been added. All told, Eurocomponents offers more than 1,000 different bits, everything from swingarms to signal lights, hand and foot controls to gas tanks and fenders. There are exhaust systems, wheels, brakes, and much, much more. It all fills a very impressive catalog. Unabashedly high-end hardware (a new Eurocomponents foot-control set, for instance, will set you back upwards of $3,000), the parts are magnificent, and well they should be. At present, there are roughly a dozen separate European manufacturers supplying Lorenzo, manufacturers that also supply Ferrari, Porches, BMW, selected Formula One race teams, and even the Swiss railroad. And the materials being used in all these parts, we’re told, “are definitely the best available.” So are the means used to make them. “All of these companies have great manufacturing capabilities,” Lorenzo notes, 3-D machining, for example, a process offering some of the most beautifully rounded edges seen anywhere. And some of it’s seen here. This motorcycle is the third show bike commissioned by Eurocomponents, each built to display the best of Europe and Eurocomponents. This time Lorenzo gave the job to House Of Thunder, an obviously inspired shop in Lubeck, Germany. Turned the job over literally, because Lorenzo allowed Eric and Jorg Vauth, the guiding forces at House Of Thunder, to design and construct pretty much what they pleased. “I never like to give a builder a lot of input,” explains Lorenzo. “When you do that you begin to limit him, limiting his style and imagination, and every builder has his own style.” Obviously, Lorenzo’s talking about good builders here, builders with taste, talent, and experience. “When you let someone like that be free to do what he wants, let him express himself, the end result will always be so much better.” Looking at this creation, that’s a build-philosophy hard to dispute. 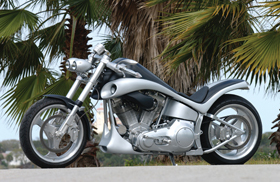 Of course Lorenzo requested that Eric and Jorg use some of the parts listed in the Eurocomponents catalog; business is business, and this motorcycle represented a $130,000 investment. 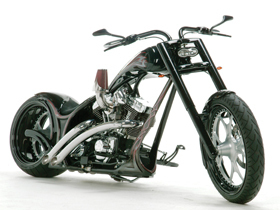 “But I didn’t want to end up with just a showcase bike using nothing but parts from our catalog. You see that done too often, and usually the end result is not so very special.” What Lorenzo wanted was something very, very different, of course using some Eurocomponents parts, but not necessarily everything in the book. 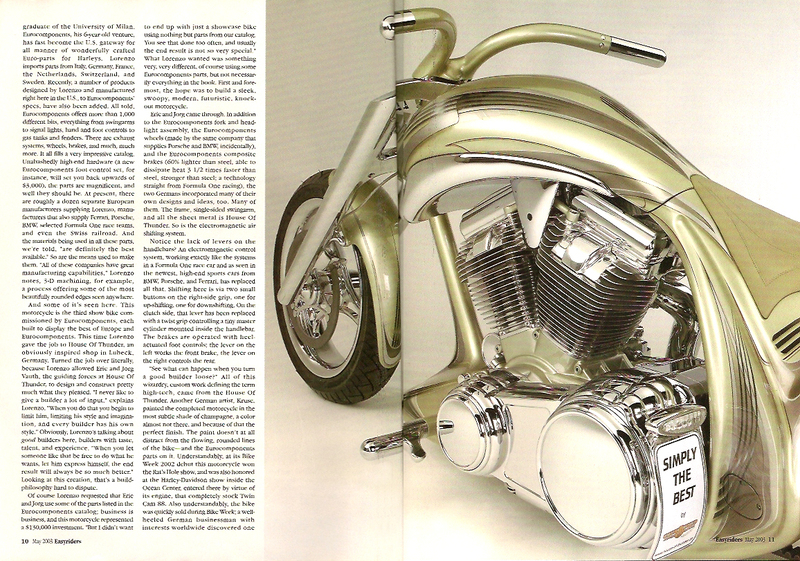 First and foremost, the hope was to build a sleek, swoopy, modern, futuristic, knockout motorcycle. Eric and Jorg came through. In addition to the Eurocomponents fork and headlight assembly, the Eurocomponents wheels (made by the same company that supplies Porsche and BMW, incidentally), and the Eurocomponents composite brakes (60% lighter than steel, able to dissipate heat 3 ½ times faster than steel, stronger than steel; a technology straight from Formula One racing), the two Germans incorporated many of their own designs and ideas, too. Many of them. The frame, single-sided swingarm, and all the sheet metal is House Of Thunder. So is the electromagnetic air shifting system. Notice the lack of levers on the handlebars? An electromagnetic control system, working exactly like the systems in a Formula One race car and as seen in the newest, high-end sports cars from BMW, Porsche, and Ferrari, has replaced all that. Shifting here is via two small buttons on the right-side grip, one for up-shifting, one for downshifting. On the clutch side, that lever has been replaced with a twist grip controlling a tiny master cylinder mounted inside the handlebar. The brakes are operated with heel-actuated foot controls; the lever on the left works the front brake, the lever on the right controls the rear. “See what can happen when you turn a good builder loose?” All of this wizardry, custom work defining the term high-tech, came from the House Of Thunder. 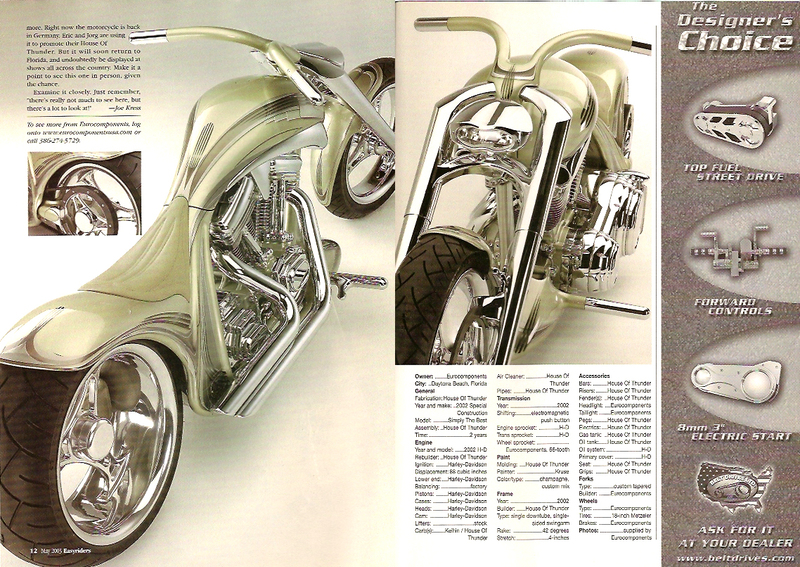 Another German artist, Kruse, painted the completed motorcycle in the most subtle shade of champagne, a color almost not there, and because of that the perfect finish. The paint doesn’t at all distract from the flowing, rounded lines of the bike – and the Eurocomponents parts on it. 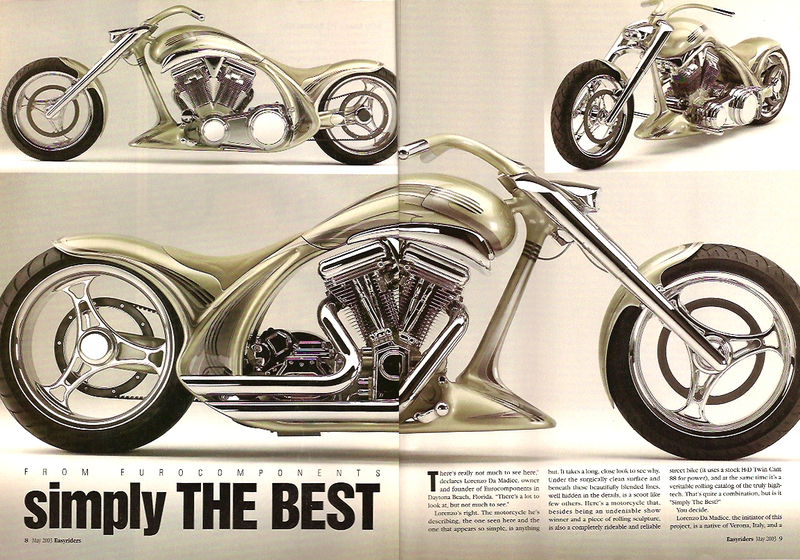 Understandably, at its Bike Week 2002 debut this motorcycle won the Rat’s Hole show, and was also honored at the Harley-Davidson show inside the Ocean Center, entered there by virtue of its engine, that completely stock Twin Cam 88. Also understandably, the bike was quickly sold during Bike Week; a well-heeled German businessman with interests worldwide discovered one more. Right now the motorcycle is back in Germany. Eric and Jorg are using it to promote their House Of Thunder. But it will soon return to Florida, and undoubtedly be displayed at show all across the country. Make it a point to see this one in person, given the chance.